With pros and cons to each platform, which should you use? Your website can be customized in ways that Facebook could never allow. Looking for a pop-up window to collect emails? Why not feature special products on the homepage, or start a blog? The choice is yours and the options are unlimited when it comes to a website that you control. You have a professional appearance online. There is nothing more professional than a website that is modern, mobile friendly, and easy to navigate. Your credibility and the digital ‘first impression’ of your company will help you stand out. Facebook profiles and business pages are free to create and use. It’s easy to upload photos, videos, posts, and other information from your phone, tablet, or computer. 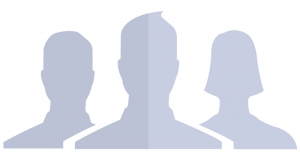 Facebook also makes it easy to find friends and invite them to “like” your page. News, updates, and other information can spread like wildfire among your Facebook fans. Your audience on social media is most likely active and engaged with your business already. The platform is designed for sharing. Compared to Facebook, a website is more complex to design and update, and has costs associated with running it. You’ll have to pay for your domain name and other features if you want a custom design or certain security tools. There are also recurring costs for hosting and maintenance that come with a website. Your visitors will never get your full brand experience from Facebook alone. You’ll have a hard time reaching people who don’t use social media, because they won’t be able to access your information as easily. You are also competing against other businesses and the algorithm, fighting for space on their newsfeed. The verdict – a healthy mix of both! Your organization can thrive in the digital space with a professional, modern website and a Facebook Page that mirrors it. You’ll expand your reach across social media without sacrificing the consumer trust that comes with a professional website. Is a rebrand right for your organization? 1. Have your products or services changed over time? Are you in a different business than you used to be? Do your potential customers understand your current offerings? 2. Have consumer expectations changed? Do your current customers believe your organization has kept pace with best practices in your field? 3. Has your target customer changed? Do you now appeal to a different customer base? Different age, income, education, geography, or lifestyle? 4. Has your competitive landscape changed? How do you stack up to your competitors? Are you falling behind them with industry, technology, certifications or relationship innovations? 5. Are you lost in the 80s? Does your organization look like it’s out of touch with the second decade of the 21st Century? Does your firm look like your parents are running it? If you answer “YES” to these questions you may want to consider rebranding your organization. We say “may” because a proper rebrand requires resources: time, money, commitment and cooperation. Rebranding goes deeper than changing the logo or colors of your business. Since your brand is the experience consumers receive from interaction with your firm, rebranding requires adapting that experience at all levels. We always say that consistency is the key to successful social media marketing, and that includes keeping an active posting schedule online. But what happens when you run out of ideas? Don’t risk losing followers just because you have nothing to post! Here are 25 social media post ideas that any business can use to spark creativity and keep up engagement. Try to always keep fresh ideas flowing across all of your channels! 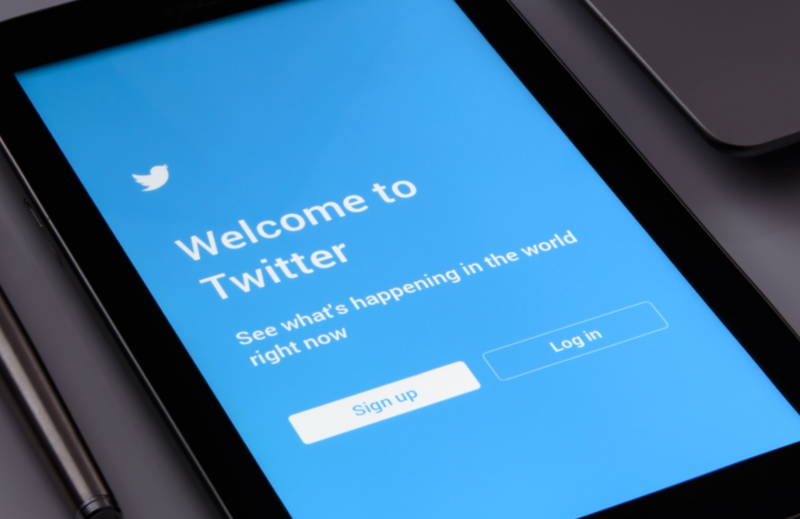 This past year, Twitter doubled its character limit for tweets. Posts were initially condensed to 140 characters, but now people have the freedom to speak freely up to 280 characters. After this new update with character limits, statistics show posts with greater than 140 characters getting more attention than those of less wording. The more words you write, the more retweets you can get. But, if you don’t have a lot to say, don’t worry! It all begins with your profile. When viewers click your page, the content on your profile is essential. Use color and photos to your advantage. For example, at Condron Media, we keep our brand colors consistent in our Twitter feed throughout our profile picture, header photo, and posts. Make sure to be clear, direct, and concise as to the image of your business you are portraying to your audience. Another way to grab viewers’ attention immediately is by pinning a tweet to your profile. Is your business hosting an event? Promoting a product? Showcasing an award or accomplishment? A pinned tweet becomes the first thing people see when they click to your profile. Personalizing quoted retweets is one way to grab attention from an audience. Many click the retweet button, but do not necessarily post a blurb with it. Why would this matter? Adding a comment to a retweet can educate your audience on a topic that you care about. You allow your voice to be heard by stating your opinion. Consider sharing an article more than once. Use different links to share articles. This will avoid confusion from followers thinking your profile is spam. Visual content is key. Our brains process visual content 60k times faster than text. When competing with 500 million Twitter posts, your goal should be to attract attention and stand out. Photos and videos are a great tool to incorporate on your profile. At Condron Media, we find it vital to post both visual and text content within most of our posts. If companies or individuals are sharing something you find amusing or relevant to your business profile, find a way to incorporate this content into your posts! Using hot topics and trending hashtags will draw more viewers to your profile. As a result, you may gain more followers and see higher engagement. In addition to hot topics and hashtags, links also increase your chances of being retweeted. Share interesting data in hopes that your followers will click the link and enjoy it too! Connect and engage with people on Twitter. In addition to sharing articles and personalizing your retweets, your brand should tag, tweet, comment and continue to repost other content to keep a conversation going. This will build a network for yourself and the business. You want to be memorable. Use clever phrases, slogans and puns to be unique. Be like your audience. We cannot stress this enough! Speak casually and freely. Show the human side of your business through your social media. What’s your favorite Twitter tip? Leave a comment below and let us know! Or, follow us on Twitter and remember to @ us if you try implementing any of our social media tips. 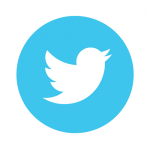 Our last newsletter had even more tips on maximizing your Twitter account. Are you signed up for our mailing list? Click here to subscribe and never miss another free newsletter! 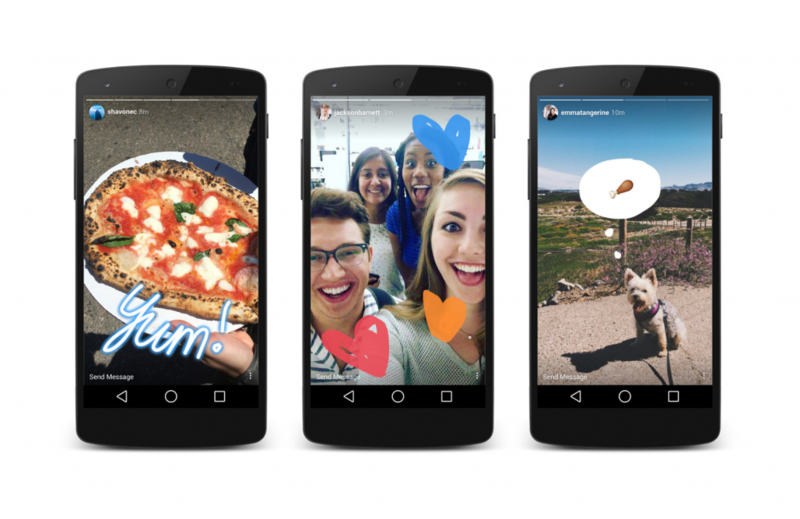 What Does It Take to Create Compelling Ads in Instagram Stories? 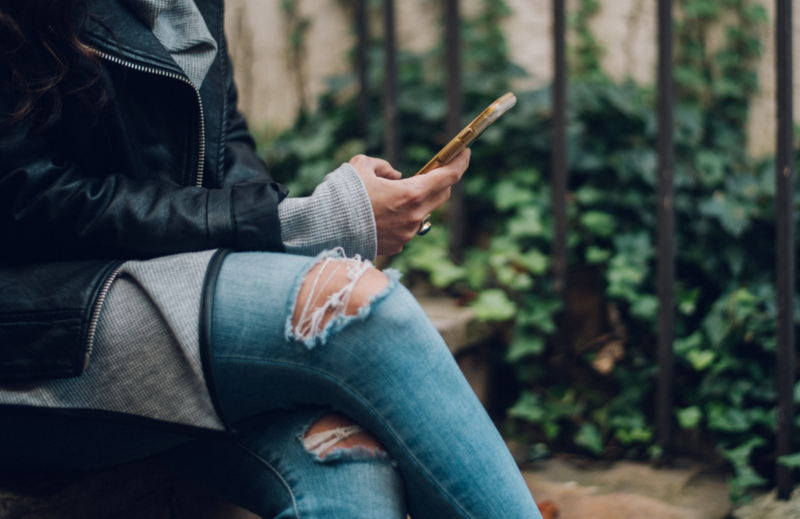 Since the premier of Instagram Stories back in 2016, brands have been connecting with their customers in more creative ways than ever. The business community on Instagram has fully embraced advertising opportunities within Stories – the vanishing content feature that rivals Snapchat – with more than half of all business accounts posting to their stories during a typical month. Stories get used by brands to share behind-the-scenes content, Q & A sessions, tutorials, polls, and breaking news. Over 300 people use Instagram Stories everyday! But what does it take to get an ad on Instagram Stories right? The app’s parent company, Facebook, conducted a study for advertisers about the way people perceive video ads on social. Here are some of the key takeaways from that study, according to Instagram. On average, top-performing Instagram Stories ads ranked higher on relevance than lower-performing ads. They also grabbed attention, were easy to understand and fit the advertised brand. On average, top-performing ads in stories were shorter and contained branding earlier than lower performing ads in stories. – Fast pacing pays off. Among ads in stories that contained multiple scenes, on average, scenes from top-performing ads were shorter than those from lower-performing ads. – Product demos boost results. Only about half of the Instagram Stories ads that were tested showed the advertised product in use, but those that did performed better on key metrics. – To be effective, bespoke ads must be mobile-optimized. Nearly half of the ads tested were built specifically for Instagram Stories, but few performed in the top third of all Instagram Stories ads studied — perhaps because they took longer to reveal the key message and contained longer scenes. 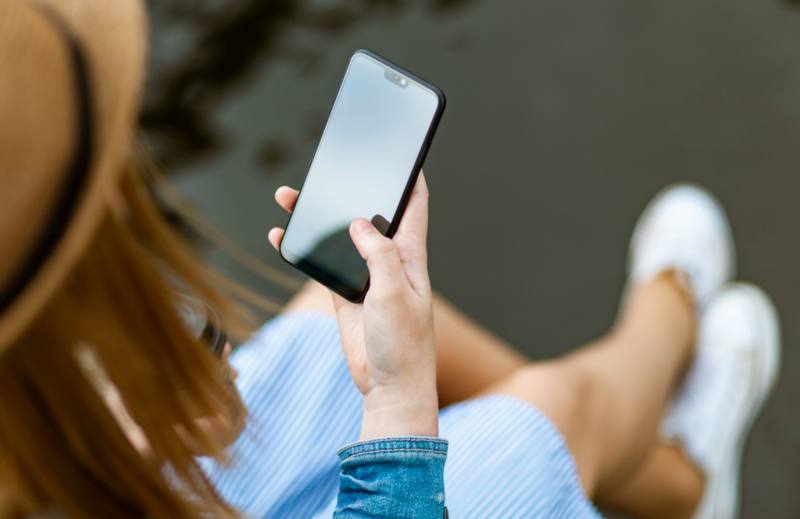 Whether your business posts to Instagram Stories like a pro or has never taken advantage of the feature before, these tips are worth remembering. Shorter, attention-grabbing ads that are optimized for mobile will be top performers. Let your creativity shine by using stickers, filters, and hashtags, or try out Instagram’s newest updates – the emoji slider and the questions sticker! Maybe you want your business to succeed on social media, but just don’t have the time to post. Condron Media can help. Get in touch with us to see which of our digital marketing services can fit your needs at hi@condronmedia.com. 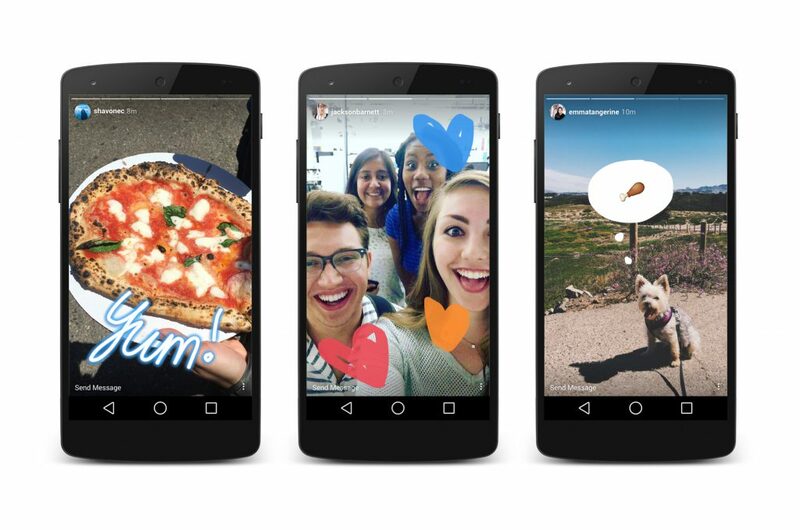 July 11, 2018 Blog, Tips Comments Off on What Does It Take to Create Compelling Ads in Instagram Stories? Launching a Social Media Campaign? Remember These 3 Tips! The first rule of running a successful social media campaign is knowing your audience. Ask yourself: Who are you trying to reach with your branded message? Understanding the identity of your target audience will allow you to determine which social platforms will work best for your message. It’s tempting to make an account on every single social media site in existence, but not always necessary. Choose wisely. If your audience is more likely to be on one specific network, don’t waste your time on a different site where your posts go unseen. For example, 46% of U.S. adults log on to Twitter daily while nearly 70% of U.S. adults are on Facebook. You need to look carefully at each platform, and determine where your target audience is spending the majority of their time. Choose the right platform for your message by centering your strategy where your audience is. After you’ve identified your audience and chosen a channel to launch your social media campaign, you need to be be selective in the content you share. Your posts should be relevant, engaging, informative, and interesting to your audience, all while maintaining the core of the campaign message. Remember to share posts that your followers will want to interact with, like colorful photos, fun facts, reviews of your products, or tips that complement the services you provide. 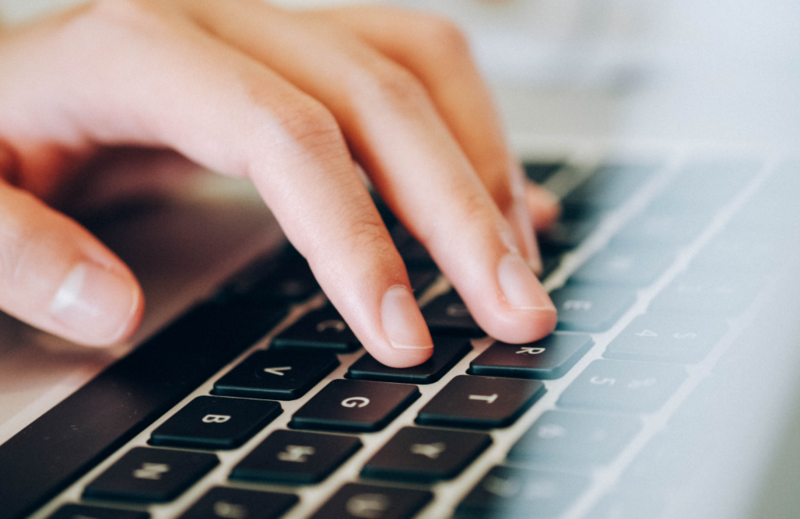 Successful social media campaigns will forge a personal connection between your business and the consumer, so remember to give your content a personal touch. Most social media channels will offer insights into the reach and level of engagement of your posts. You can gather all kinds of information about the content you publish, the people who see it, and the success rate of your efforts. You can gain further insights into the users who comprise your audience, as well. What time of day is your audience engaging in your content? Who shares, likes, or comments on your posts? Use these metrics to determine what’s working, and what isn’t. More importantly, don’t be afraid to make changes! If something isn’t working, try a new tactic or make changes accordingly. Use all available feedback to continuously improve your strategy. Over 70% of small businesses use social media, which means that regardless of which channels you choose, you’re going to be fighting for space in the crowded social media landscape. 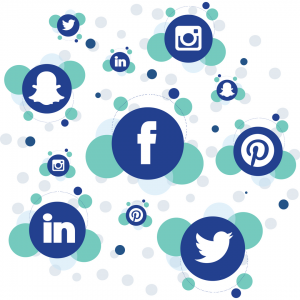 A social media presence doesn’t guarantee success, which is why we stress the importance of strategy at Condron Media. We work with our clients to develop custom posting schedules and create unique, relevant content. We offer a range of services that include planning, process, full creative and publishing management to fit businesses of every size. Want to learn more about our social media services? Give us a call to start working with us on your next project or campaign! June 25, 2018 Blog, Tips Comments Off on Launching a Social Media Campaign? Remember These 3 Tips! In the world of social media, Facebook is an undeniable powerhouse. The platform reported surpassing more than two billion active users last year. There are countless eyes on content, and Facebook can be an incredible tool for growing your small business. But how will you stand out in an increasingly large crowd? At Condron Media, our job is to put your message in front of as many of those eyes as possible. Here are some tips for making the most out of your Facebook presence. Grow your audience: Simple things such as “Like us on Facebook” buttons on your website, or a poster in your business inviting people to like your page can help increase your number of fans. It’s always easier to reach people who like you in the real world, but even devoted customers might need an extra push to join your Facebook audience. Consider attention-getters like hosting contests and giveaways, featuring customer photos, or posting seasonally-themed content. People will share content that interests them, and every Facebook friend of a follower is a potential new “Like” for your business page! Ads and boosted posts: Facebook users are bombarded with hundreds of posts in the timeline of content when they sign on. Your post may get lost in the shuffle for your devoted fans – Boosted Posts can help catapult you to the top of the list. 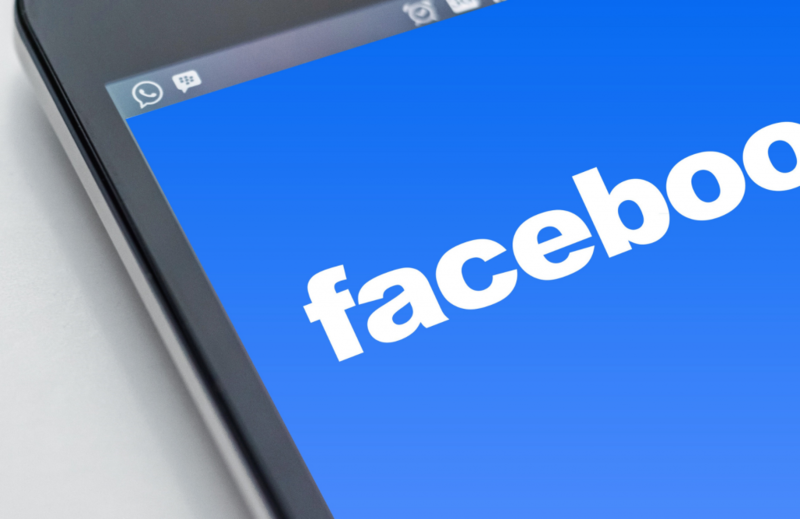 Facebook ads can also help break free from the boundaries of those who “like” your page and put your message in front of specific demographics. These tools, when used correctly, will attract new customers and promote your business to existing fans. Condron Media can help you find the right fit for your marketing dollars! 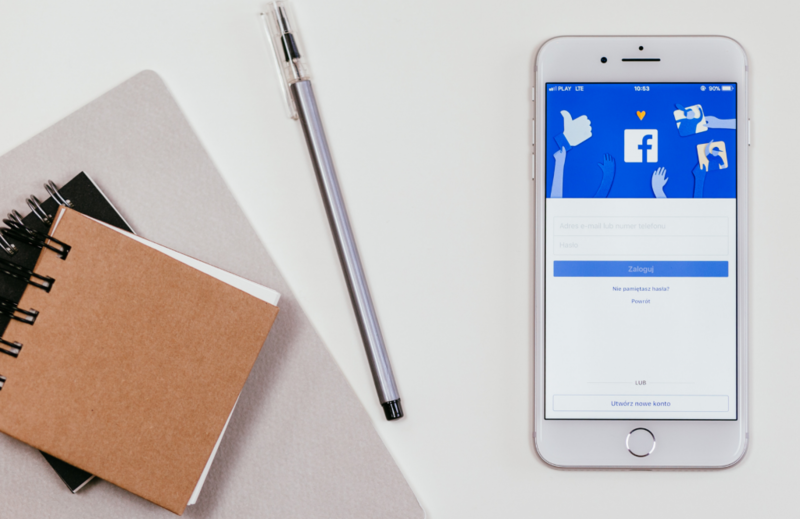 Reach out and be responsive: Visitors who come to your Facebook page directly are probably already interested in your business. Some people may visit to leave a review or send a message asking about products and services. Always take the time to foster positive interaction with those who send messages or leave comments. American Express suggests partnering with other small businesses to enrich the audiences of both businesses. In the same way a summer sidewalk sale can attract passers-by to multiple businesses, cross-promoting fellow small businesses can increase your audience on Facebook. The social media landscape is ever-changing, but right now Facebook is the biggest place to be. 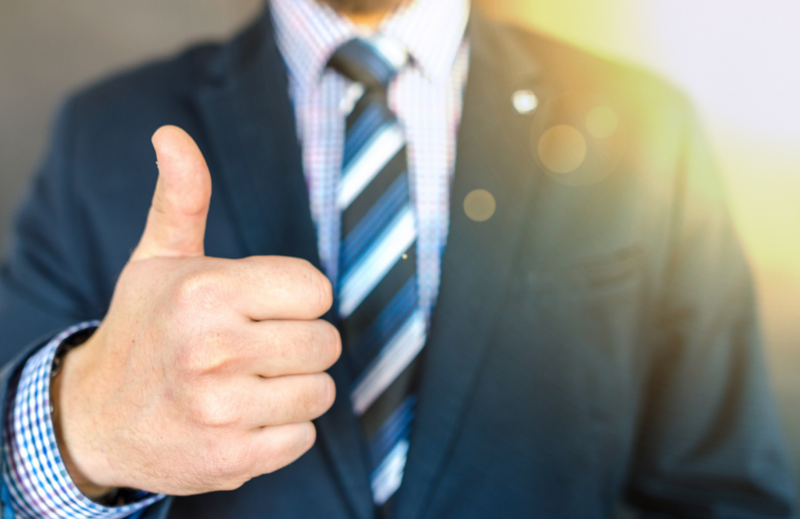 At Condron Media, we are always excited to see our clients and partners succeed. Contact us today if you’re interested in taking your social media strategy to new heights! Social media marketing trends are increasing every year. Many popular platforms like Facebook, Twitter, and Instagram give businesses of all sizes a way to communicate with their target audience. Facebook reigns as a top social media giant, with 42% of marketers reporting that the platform is critical or important to their business. 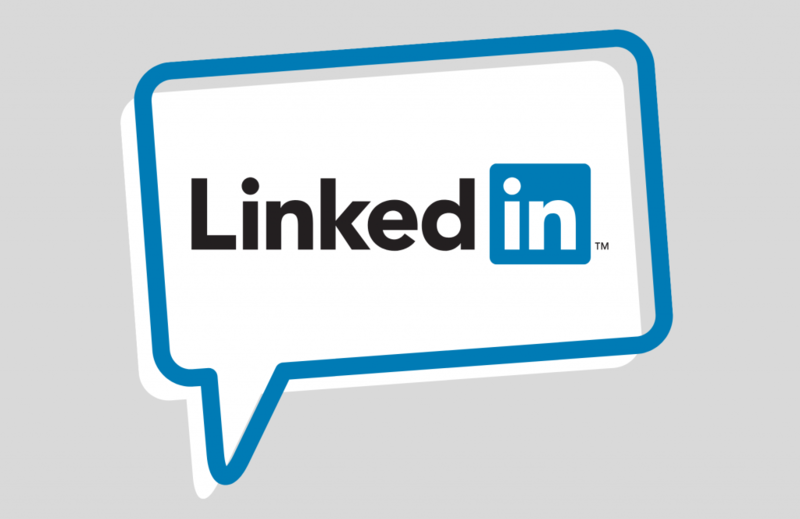 However, LinkedIn is a social networking site that is often overlooked as a way to reach consumers and create value for a brand. LinkedIn Company Pages are free to create. Much like a Facebook Business Page, you can design your brand’s profile with your logo and a cover image, as well as a description of what your company does and what makes it stands out from its competitors. Colleagues, customers, and other LinkedIn users can follow your Company Page. Your employees can add your Company Page to their own profiles, which will also increase buzz for your business. Posting to LinkedIn is an easy way to build brand awareness and attract followers once your page setup is complete. Share company news, milestones and industry trends, or ask followers to weigh in on relevant topics. Your posts will appear on your Company Page as well as your followers’ news feeds. You can choose to promote your brand with sponsored posts, too. New data shows that creating the perfect LinkedIn post takes some finessing. Posts with links have the best reach, but text-only posts are pretty good too. Unlike other social platforms, hashtags and emojis are simply not as effective on LinkedIn as they are on Instagram or Twitter, so it’s best to leave them out. Condron Media can help optimize your Company Page’s appearance in search results and build an audience on LinkedIn. We specialize at creating effective posting schedules, creating original content, and leveraging analytics that will engage your followers. If you do not have time to create, update, and monitor your Company Page, we can certainly do that for you. And if you think your business wouldn’t benefit from exposure on LinkedIn, think again. Don’t underestimate this powerful social media platform! We consume content through a number of mediums these days. Mobile, desktop, video, social media, billboards, TV ads, and more are all competing for our attention. Despite this, one surprising medium has outlasted and outperformed all the rest. Traditional radio reaches more Americans each week than any other platform. A whopping 93% of U.S. adults are reached by AM/FM radio, compared to other types of media including television, smart phones, PC, and mobile devices, which only reach 89% or less of the population. Who is listening, and where? Audio platforms have evolved along with the rise of technology, and so has Condron Media. 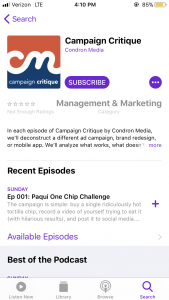 We recently launched our own podcast, Campaign Critique, where listeners can enjoy industry tips and tricks as we break apart a different marketing campaign in each episode. We examine what lessons small businesses can learn from major marketing efforts, and dissect the successes or failures of that particular campaign. The podcast is available through iTunes, the Google Play store, or any preferred RSS reader. 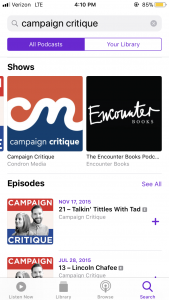 You can learn how to subscribe to Campaign Critique, or any other podcast, in one of our previous blog posts. Subscribing to a podcast has various benefits as a listener, making it more convenient for you in a number of ways. 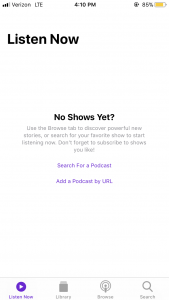 For starters, once you subscribe, each new podcast is downloaded to your phone automatically, which thereafter will use no data while listening, even while on the go or driving. Subscribing will also notify you when a new episode is available, and keeps all of your favorite podcasts in one spot. Visiting http://condronmedia.com/podcast/ has 2 quick options, “Apple Podcasts” (for iPhone or iPad devices) and “Google Play” (for Android devices) clicking either of those will lead you to an onscreen iTunes and Google Play, respectively. Google Play has a “subscribe” option right on the screen, and iTunes prompts you to open in the podcasts app, which will lead you to a screen with our podcast where a “subscribe” button will be available. The podcast will then be added to your subscriptions. There are a few more ways to subscribe if you’re not reading this on your phone right now. 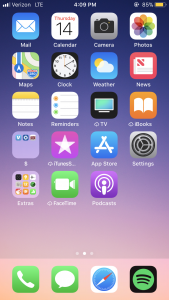 There are a number of ways to subscribe to a podcast using your iOS phone, one of them is through the Podcast app that comes pre downloaded with every Apple iPhone. Hit “SUBSCRIBE” and you’re done! 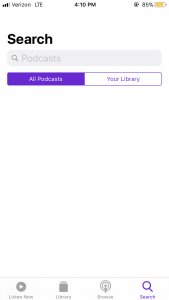 For easy access after subscribing, open the Podcast application and tap “Library” on the bottom of the screen to see all new available Podcasts. Many other apps are available for download through the Apple app store, and the process is similar. 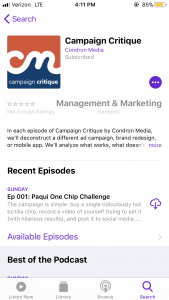 Open your desired podcast listening app, search “Campaign Critique” in the search bar and click on the correct search result. Tap on our podcast and hit “subscribe” when it prompts you to. The application that Android offers for Podcasts is Google Play Music. Tap the three horizontal lines on the top left hand side of the screen. That is the menu. This screen offers a variety of search options, including Top Charts and All Categories. To search for a specific title, tap the eyeglass icon on the top right hand side of the screen, then a search bar will appear. 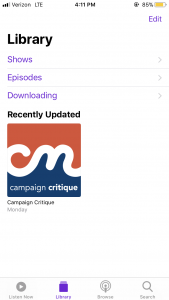 Once you are subscribed, you can access Campaign Critique by clicking the menu button on the top left hand side of the screen (the three horizontal lines), tapping “podcasts” and then “your podcasts” on the next screen. All of our available podcasts will appear. 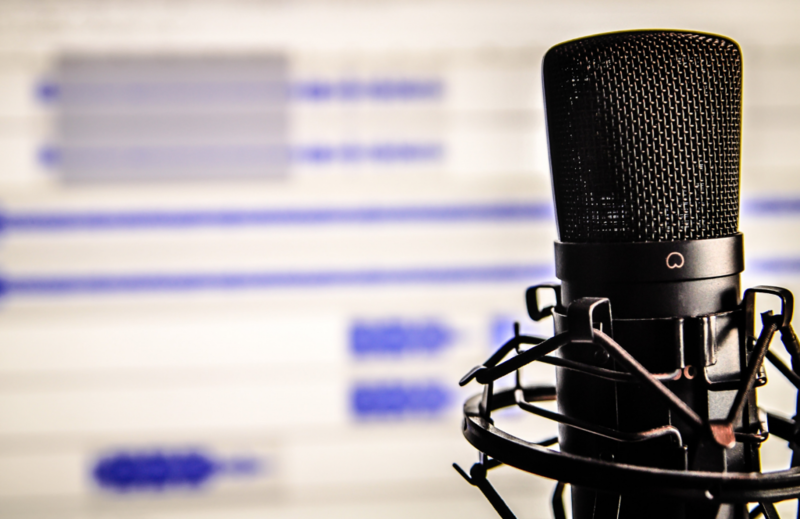 Although Apple and Android have application platforms to listen to Podcasts, the majority of websites and companies use RSS to publish their podcasts as well, and Condron Media is no exception. RSS stands for “Really Simple Syndication”. An RSS reader manages your subscriptions for you, so you don’t have to individually visit each website to find the newest podcasts. There are many RSS readers, called podcasters, but one of the most popular is iTunes. If you have any issues subscribing to Campaign Critique please let us know.